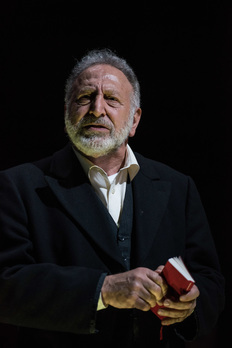 Poignant: Philip Leach in the title role of Tread the Boards' production of King Lear. ​You could hardly accuse Stratford’s fringe company Tread the Boards of not being ambitious. Not exactly graced with the resources of their internationally famous Shakespearean colleagues across Bancroft Gardens, this enterprising outfit celebrates its tenth year in the home of the Bard with two contrasting productions. Much Ado (reviewed below) provides the laughs: King Lear offers gravitas by the bucketload. Anyone familiar with the company will not be surprised to learn that the sizeable ensemble has strength in depth, with even the smallest roles delivered with real talent and a youthful energy. Tread the Boards manage to source skilful actors in sufficient numbers to make a production of this scale really work in the tiny loft space of the Attic Theatre. The wide and shallow playing space means the action is never more than a few inches away from the studio theatre audience, and director John-Robert Partridge exploits the opportunities for intimacy and immediacy that the intense proximity supplies. Effective lighting by Kat Murray and a simple set design by Zoe Rolph also contribute to the overall impact. Among the players, Matilda Bott doubles intriguingly as Cordelia and the Fool, demonstrating both innocence as the former and a talent for tomfoolery as the latter, while Pete Meredith’s villainous Edmund is charismatic and sinister in equal measure. But the truth is that the acting is universally top-notch, and one of the greatest feathers in the cap of this small but beautifully formed troupe. Appropriately enough, assuming the performing crown is Philip Leach in the title role. Generally accepted as the Everest of Shakespearean parts, Lear ranges from rage to insanity, poignancy to pathos, and Leach can do them all. There’s never a moment when he’s on stage when you find yourself analysing the acting: it’s always believable, truthful and emotionally engaging. The wayward monarch’s descent from megalomania to madness is intelligently drawn, and Shakespeare’s language is delivered with consistency and care. At a little over three hours, the production could probably stand a tad more editing, but there’s no denying the quality of the company and its commitment to offering a visceral, vibrant alternative to the big boys (and girls) up the road. There’s nothing second-class about these citizens. King Lear plays in repertory with Much Ado About Nothing until Sunday, April 21, 2019. Brisk and breezy: John Robert Partridge and Alexandra Whitworth as Beatrice and Benedick. Those in the know understand that there is more to Stratford-upon-Avon’s Shakespearean offerings than the RSC. 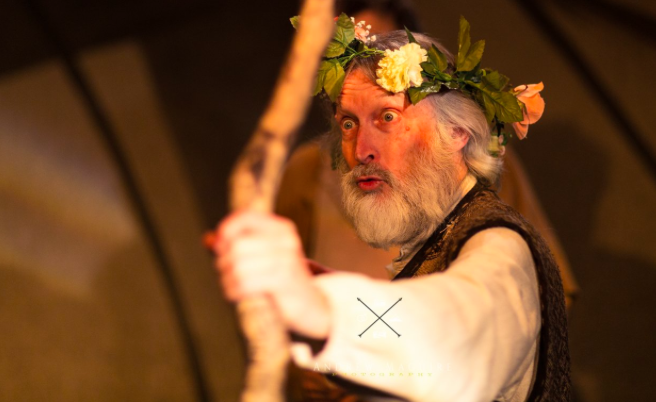 Just across Bancroft Gardens, snuggled in the beams of the Cox’s Yard complex, sits The Attic, whose resident company Tread the Boards regularly delivers some of the most consistently enjoyable and audience-friendly productions of the Bard that you could wish for. Much Ado, directed by first-timers Matilda Bott and Robert Moore, follows in a long line of appealing, accessible productions of Will’s works, and brings the company’s usual spirit of playfulness and professionalism to bear on the tale of sparring partners Beatrice and Benedick. Performed in modern dress, on a stage adorned with a lush green lawn and strung with fairy lights, this brisk, breezy interpretation wisely concentrates on the will-they-won’t-they pairing at its heart, while side plots involving the scheming uncle Don John and the dim-witted yokels who make up the neighbourhood watch are given just enough room to make sense without becoming a wearisome distraction. John Robert Partridge as Benedick has a wonderful facility with the language, ranging intelligently from high comedy to charming pathos, and he’s ably supported by Georgia Kelly and Pete Meredith as his compatriots Donna Patricia and Claudio respectively. Alexandra Whitworth’s Beatrice has flashes of sparkle, and her interactions with her cousin Hero (Kate Gee Finch) are full of fun, while the directors contribute nice cameos as Don John (Moore) and Dogberry – a show-stealing turn in twinset and pearls by Bott. The action is beautifully paced and the simplicity of the set and lighting (Kat Murray) helps keep the focus on the well-spoken text. The intimacy of the space means there’s precious little room for manoeuvre and every performing nuance is exposed, but with hands as safe as these, that’s never an issue. 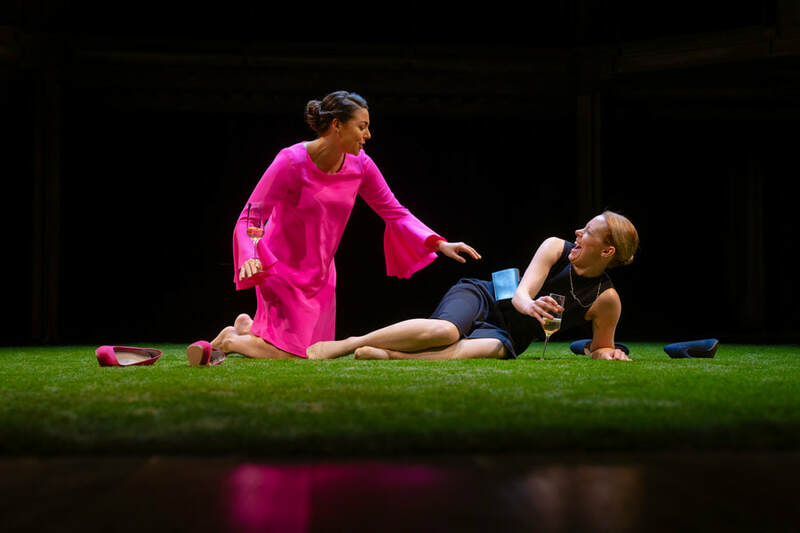 Much Ado About Nothing plays in repertory with King Lear until Sunday, April 28, 2019. Black and white: John Kani and Antony Sher star in Kani's new play Kunene and the King. Photo by Ellie Kurttz © RSC. John Kani’s deeply personal new play about the impact of apartheid 25 years on stars the playwright and RSC stalwart Antony Sher. Tricky: Claire Price stars as Petruchia in the gender-swapped production of The Taming of the Shrew. Photo by Ikin Yum © RSC. ​A gender-swapped version of Shakespeare’s tricky play, directed by Justin Audibert, plays in rep with As You Like It and Measure for Measure. Sophie Khan Levy and Lucy Phelps as Celia and Rosalind. Photo by Topher McGrillis. © RSC. Kimberley Sykes directs the first in the RSC’s new ensemble season. Kathryn Hunter stars as Timon of Athens. 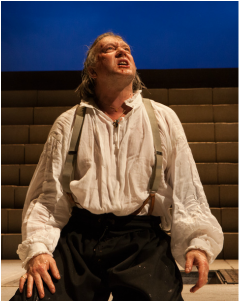 Photo by Simon Annand © RSC. Kathryn Hunter stars in Simon Godwin’s filleted version of Shakespeare’s play. Trying It On: David Edgar, writer and performer. David Edgar’s 1983 play Maydays reaches the end of its all-too-brief run at Stratford’s The Other Place after shaking up quite a few preconceptions and shining a harsh spotlight on today’s political agenda. Now, to coincide with its closure, the playwright himself gives just three performances of his own one-man show as a kind of companion piece. Devised following a conversation in which he mused about how he would explain his current political thinking to his younger self – 50 years younger, in fact – Trying It On is a glorious mix of self-effacing fallibility, hilarious pomposity-pricking and biting social comment. Its form (which I won’t divulge for fear of giving too much away) matches the brilliance of its content and it’s no trouble at all to set aside the acting shortcomings of a man who, by his own admission, hasn’t performed on a stage since his student days, and never professionally. And while he doesn’t let himself off the hook, with frequent challenges to his relative inaction politically or his ‘selling out’ to become a mainstream writer, neither does he allow the audience to be complacent. Instead, we are invited to reflect on our own complicity in creating a world – and legacy – which could hardly be said to be inspiring to the generations coming along behind. These tough messages are wrapped up in flashes of Edgar humour, but retain their sting nonetheless. Director Christopher Haydon and designer Frankie Bradshaw position their man in front of an array of cardboard boxes and filing cabinets which serve as both backdrop for projected images and video and useful containers for some selectively employed props. The effect is simple but clever, supplementing Edgar’s 90-minute monologue without ever overpowering it. He’s said to have had second thoughts about going through with the whole project, but it’s a tribute to his resilience, natural charm and profundity that Trying It On carries such a powerful punch. It may not claim a gong for acting, but the production is unquestionably a winner. Distress call: Richard Cant as Jeremy in David Edgar's epic Maydays. 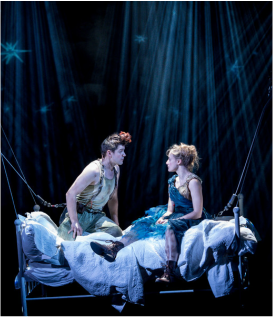 Photo by Richard Lakos © RSC. It’s been 35 years since David Edgar’s exploration of the roots of Thatcherism was first staged by the RSC. Then, it was at The Barbican in London with a cast of 20 and a contemporary urgency that put a harsh spotlight on the failings of the political left. Today, it’s got a surprisingly fresh feel to it, and much of that urgency remains. In reworking it for a cast half the size and the studio setting of Stratford’s Other Place, Edgar has transformed it into a history play that still carries significant resonance for a 2018 audience. It’s political polemic, there are no two ways about it. And while the arguments are constantly shifting in the mouths and minds of the characters, it’s ultimately a hectoring, didactic piece of theatre that never quite breaks free of its politics to engage the heart as strongly as it does the brain. That’s not to say it isn’t epic, timely and beautifully written, and in the hands of director Owen Horsley and his team it is impeccably delivered, with a carefully judged mix of vinegar and honey. Richard Cant’s pragmatic socialist Jeremy, in particular, smooths the edges of revolutionary zeal with disarming charm and credibility. Mark Quartley as his student Martin is all fire and vibrancy in his youth, but later swayed by middle age and his mentor into a new perspective. The characters’ through lines are all clearly drawn and the way Edgar has restructured the piece to bring them together in the third part feels less contrived than it might, although his conclusions are far less tidy than his plotting. And quite right too: with the benefit of several decades of hindsight, and with the world in its current state of turmoil, things look much less straightforward than they used to. As Martin angrily demands of his erstwhile communist chums, how will we look back on these days and events in five years’ time? Horsley and his designer Simon Wells accentuate the themes of each of Edgar’s three unevenly divided sections with the staging. 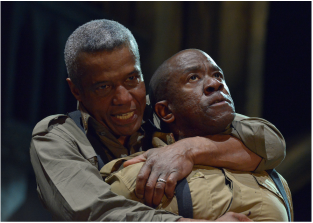 The first part, performed in the round, focuses on the student anger of the post-war years and 1960s, when communal groups worked together to fight the battle of the oppressed. Switching to Cold War Eastern Europe, the theatre is reconfigured as a traverse stage, emphasizing the us-and-them nature of the struggle. 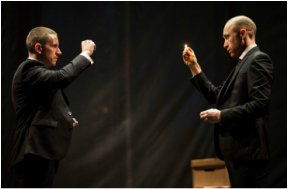 By the third part, as Jeremy and Martin both succumb to the practicalities of a kind of libertarian conservatism, the staging has become a conventional end-on theatre – traditional and safe, one might infer. But the power and strength of all the ensemble’s performances – whether major role or minor supporting player – make this far from safe, and fully in keeping with The Other Place’s stated mission to shake up our view of society. As its title implies, Maydays remains Edgar’s urgent distress call to an increasingly topsy-turvy world. Jude Owusu as Tamburlaine. Photo by Ellie Kurttz © RSC. For ten years, Michael Boyd ran the RSC, overseeing the construction of the new main house and the redevelopment of The Other Place. This undoubtedly gave him invaluable insight into how the organisation’s three theatre spaces work, and it’s knowledge that he has put to excellent use in this condensed production of Christopher Marlowe’s bloody history plays. The Swan is often cited by performers and directors alike as one of their favourite houses in the world, and on this showing it’s easy to see why. Designer Tom Piper has worked brilliantly with director Boyd to locate the many and varied battles and conquests in a semi-recognisable world of greatcoats, AK47s and metallic surfaces. Ladders, grilles and spot-welds abound, creating a kind of gothic dystopia familiar to sci-fi fans yet somehow clearly rooted in Marlowe’s Elizabethan milieu. This, together with an explosive, percussion-heavy score by James Jones, lays the groundwork for some very fine ensemble performances, strongly reminiscent of the Shakespeare Histories cycle that Boyd directed when he ran the place. Some startling doubling of roles – often achieved with a knowing look to the audience – enables through lines of narratives to emerge even more clearly, so that the double-dealing brother of Persian king Mycetes later becomes the treacherous King of Hungary, both meeting a grisly end at the hands of the eponymous Tamburlaine. Boyd’s smart decision to fillet Marlowe’s original two plays into one (albeit long) production pays off handsomely, with the storytelling placed firmly centre stage throughout. There may be moments when one bloodthirsty siege starts to look much like another, but the ingenuity of Tamburlaine in finding increasingly sickening and vengeful penalties for his enemies is particularly impressive. Boyd wisely opts for symbolic representations of the on-stage executions and deaths by having victims smeared with blood from a bucket or, in more extreme cases, having the bucket’s contents emptied over them. On the basis of ‘less is more’, the impact of this symbolism is to enhance its power, even if it requires a small army of stagehands to clear up the mess in the interval. There are many excellent performances across the company. David Sturzaker speaks the language impeccably and is unquestionably a star Shakespearian in the making; Rosy McEwen appears and sounds serenely controlled as the tyrant’s wife Zenocrate; and Sagar IM Arya and Debbie Korley make a tragic Turkish emperor and empress humiliated beyond endurance. 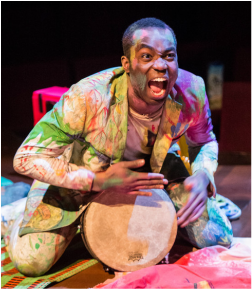 At the heart of the production is a towering performance from Jude Owusu, who gives Tamburlaine himself enough depth and dimension to range from our sympathy to our outright horror at the vulnerability of the man or the jaw-dropping inhumanity of the despot. He’s every inch the soldier, but also a loving husband reduced to a quivering wreck at the death of his queen. And yet he’s credibly capable of murdering the son who fails to live up to his ideals of what a warmongering ruler should be. It’s dark, it’s highly resonant for these troubled times and it’s a gruelling three-and-a-quarter hours long, but as a tribute to the vibrant, rollicking narrative style of the young Kit Marlowe, it makes a noise almost as thunderous as the percussion. Very merry: David Troughton and Beth Cordingly. Photo by Manuel Harlan © RSC. ​Fiona Laird’s modern-dress version transposes Windsor to Essex, with David Troughton starring as the fat knight Falstaff. ​There can hardly be an adult alive today who does not know The Wizard of Oz inside out: thanks to perennial Christmas repetitions of the 1939 Judy Garland film, it’s pretty much in everybody’s DNA. Featuring the first major use of Technicolor, it is, of course, a colossal extravaganza of song, dance, special effects and big-budget spectacle. Which might make you worry about the capabilities of a tiny production, performed by a cast of just seven in an intimate black-box studio theatre above a pub in Stratford-upon-Avon. But if you think small scale means small ambition, then think again. Tread the Boards Theatre Company – fast approaching its tenth anniversary in the cosy Attic Theatre – manages to make this energetic, joyful production into something that is every bit as spectacular as its glossy predecessor. Some of it they achieve by borrowing freely from the movie, including Dorothy’s signature song Over the Rainbow, large chunks of instantly recognisable dialogue and the gleeful cackle of the Wicked Witch of the West. But the rest is pure Tread the Boards, an effervescent mixture of idiosyncratic humour, knockabout silliness and, above all, crystal-clear storytelling. This adaptation veers away from its film forebear in numerous narrative ways, including a number of wonderfully over-the-top character roles by Daniel Arbon, who spends half the time channelling Monty Python and the other half Robin Williams. In fact, he’d be in danger of stealing the show from Dorothy and her three travelling companions were it not for the fact that they are uniformly superb. Matilda Bott is beautifully wide-eyed and innocent as the little girl blown by a tornado to faraway Oz, and her consistency and charm form a crucial linchpin to proceedings. Around her spin a trio of lovable, laughable turns in the shape of John-Robert Partridge’s deftly slapstick Scarecrow, Robert Moore’s endearingly empathetic Tin Man and James Tanton’s sweetly pathetic Lion. All three judge their performances to perfection, never stealing the limelight but creating a team that you constantly root for. Ashleigh Dickinson is a delightful presence in her anchoring roles as Auntie Em and Glinda the Good Witch, while Alexandra Whitworth relishes every moment of her villainous doubling as Miss Gulch and the Wicked Witch of the West. But it’s the creativity and imagination of the overall production that ultimately lifts this Wizard of Oz into something rather special. Whether it’s the brilliantly conceived Munchkins, the cleverly executed trickery of the Wizard himself or the hilariously tongue-in-cheek special effects, there’s never a moment when the audience isn’t in on the company’s joke: the constraints of the space and the limitations of budget are circumvented again and again with moments of near-genius that, far from minimising the dramatic effect, actually enhance it by the sheer audacity of their execution. Director Partridge and his creative team certainly know how to use their resources to the max. And with a laugh squeezed out at every opportunity, there’s as much here to entertain the adults as the younger members of the audience. With just a couple of weeks left to run, until the August bank holiday weekend, this show comes highly recommended. Peter Hamilton Dyer as the newspaper editor in #WeAreArrested. Photo by Ellie Merridale. There’s a dictum frequently trotted out to dramatists that they derive their greatest potency if they “show, don’t tell”. By a strange quirk of programming – and writing, come to that – the current double bill offered in the round under the RSC’s annual Mischief Festival banner demonstrates the exact opposite. Day of the Living is a devised piece based around the unsolved disappearance in 2014 of 43 student teachers from a Mexican college. It could be said to suffer from the devisers’ curse: too many ideas and not enough restraint. While the underlying factual narrative is, of course, horrifying and an entirely appropriate topic for a festival aimed at unsettling the received wisdom, its execution in this ramshackle, half-formed way does little either to educate those of us who are ignorant of the details or to shine a spotlight on “life and the Mexican spirit”, as the programme optimistically puts it. Instead we get every in-vogue theatrical device, from verbatim survivor testimony and masks to pastiche Mariachi music and slow-motion re-enactments, with some Mexican history, wrestling and a song about turtles thrown in along the way. It’s vivid, brash and confusing, but the hotch-potch of chaotic ideas ends up being counterproductive to its central theme of endemic corruption. By contrast, #WeAreArrested is a model of subtlety and nuance, and all the more powerful because of it. Up first in the double bill, it is by far the more effective and affecting of the pair. It’s essentially a 75-minute monologue telling the story, in his own largely dispassionate words, of the Turkish newspaper editor Can Dundar’s road to exile. 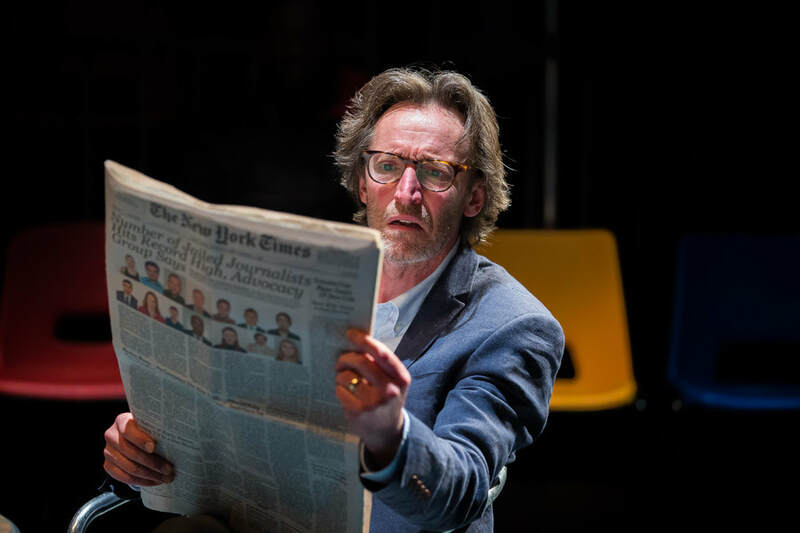 Intelligently curated by director Sophie Ivatts and RSC literary manager Pippa Hill, and enhanced by a handful of magical stage effects, Dundar’s words are delivered impeccably by Peter Hamilton Dyer as a completely credible journalist juggling personal priorities with professional integrity. Occasionally other figures pop up – his wife, his son, his boss – for a few brief interactions, but the play is a formidable tour de force for Dyer, and his neutral, reportage style of delivery is beautifully judged to accentuate the nightmare story that is unfolding. When he does finally allow his emotions to erupt, it’s electrifying. The debate about truth, facts and fake news could hardly be more apposite, and #WeAreArrested explores these ideas from a journalist’s perspective. What it also does, with well-judged elegance, is make them work dramatically as well. It’s deeply moving and intellectually potent. Erica Wyman directs a youthful and energetic interpretation of Shakespeare’s tragic love story. The tradition of actor-manager may have died out in most of our mainstream theatres, but it seems the template is alive and well and delivering quality work on the Stratford fringe. Tread the Boards Theatre Company, established in 2009, has spent most of the last decade building its reputation as the area’s leading fringe company under the management of husband-and-wife producer and director Catherine Prout and John-Robert Partridge. Partridge offered a fine Henry V last year - it’s his company, so why not? - and now takes centre stage again in a clear, comprehensible production of the Bard’s most villainous history, Richard III. But it would be wrong to portray Tread the Boards as some kind of vanity project, putting on shows just so its leading man can play the best parts. Make no mistake about it: Partridge is up to the job. His Henry was statesmanlike and rousing, his Richard is equally persuasive, only this time in the opposite direction. With a deformity that is convincing without being over-the-top, he utters some of Shakespeare’s most recognisable lines with a freshness that catches you by surprise. There’s a scheming twinkle in his eye and his ultimate downfall from despotism is marked by a raging passion that fills the tiny studio space of The Attic Theatre in Cox’s Yard. Director Jonathan Legg is constantly always aware of sightlines and visual variety, keeping actors and action moving whenever possible, but even running at more than three hours (and yes, it could probably stand some cutting), interest rarely flags. Much of this is due to the hard work of the 13-strong ensemble cast, rendering this Richard as more than a one-man turn. Among the impressive support, David Hubball makes a poignant Clarence, murdered by his brother Richard for reasons he clearly cannot begin to fathom. Kate Gee-Finch and Matilda Bott are both moving as two of the many queens wronged by the usurper, and it’s good to see students from Stratford College doing more than simply making up the numbers as they are given valuable professional experience with a local company. Playing in repertory with the group’s other spring Shakespeare, A Midsummer Night’s Dream, this Richard is strong and effective, even if it seems to be a harder sell on paper than its comedy partner. 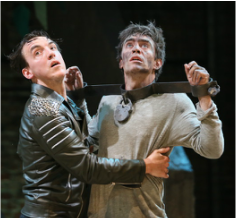 Richard III and A Midsummer Night’s Dream run until Sunday, April 22, 2018. Sophie Stanton as Mrs Rich. Photo by Helen Maybanks © RSC. Sophie Stanton entertains as social climber Mrs Rich in this obscure satire dusted off by Jo Davies. While the RSC’s current fare across Bancroft Gardens offers blood by the bucketload in the shape of Macbeth and The Duchess of Malfi, Stratford’s leading fringe company Tread the Boards has taken the nifty programming decision to go for something far more family-friendly. It may not be very springlike in name, but A Midsummer Night’s Dream certainly resembles an April daffodil: bright, fresh and pleasing to the eye. In the intimate, close-quartered environment of The Attic Theatre at Cox’s Yard, it engages and entertains in equal measure and delights audiences from young children to those of us of a more mature vintage. Directed by the company’s artistic director John-Robert Partridge, this version is neatly filleted to an hour or so each way, which keeps the momentum tumbling along, and the sense of fun is palpable throughout, whether it’s the sparring between childhood friends-turned-rivals Hermia (Matilda Bott) and Helena (Kate Gee-Finch) or the daft antics of the Rude Mechanicals, here played as a mixture of stereotypical amateur theatrical types to great effect. Edward Manning’s Bottom (if you’ll pardon the expression) is all melodramatic bluster, while Robert Moore mines twice the comic magic from his doubling of Athenian romeo Lysander and hilarious car mechanic Flute - looking far too comfortable in high heels and a frock. There are some nice touches of humour, from the poor beleaguered stage manager to the doddering old tea lady, and every opportunity for laughs is eagerly seized. And while this might not make for the most subtle of interpretations of the Bard’s most popular play, there’s no denying it’s charming, intimate and full of fun. A Midsummer Night’s Dream plays in repertory with Richard III until Sunday, April 22, 2018. Niamh Cusack and Christopher Eccleston as the Macbeths. 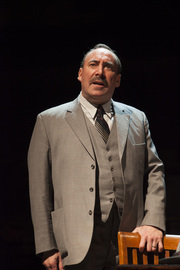 Photo by Richard Davenport © RSC. There’s a note in the programme of this new production of Shakespeare’s tautest thriller that makes explicit the link between Macbeth and modern horror films. Director Polly Findlay is clearly a fan of the genre. So we get many references – some subtle, many far less so – to the movies, from freeze-frame blackouts to jump-cut edits, all in the name of creating suspense, tension and those all-important thrills. The bad news is that much of this conceptualising is superfluous at best, positively damaging to Shakespeare’s drama at worst. The good news is that the RSC won’t give a damn what I or any other critics think as the Stratford run is pretty much sold out. And quite right too: casting Christopher Eccleston and Niamh Cusack as the despicable double-act in this most accessible of tragedies deserves a decent audience response. So leaving aside the popular appeal of the production, kicking off a new season for the company with some fresh graphics and a full slate of female directors, it’s still pertinent to ask: is it any good? Well, to be honest, it’s something of a mixed bag. It looks great, crisply and cleanly designed by Fly Davis with a modern aesthetic (although that does prompt awkward questions such as why does nobody have a gun for a weapon, or carry a mobile phone?). Fine Shakespearean performances from the likes of Edward Bennett as the far too sidelined Macduff or Tim Samuels as a chilling Lennox make one suspect they may have wandered in from a different production altogether. And Rupert Cross’s visceral, aggressive soundscape helps set the mood in a brutal kind of way. On the down side, some heavy-handed dramaturgy hacks the Bard’s text about with no compunction and not much compassion, distributing lines to all and sundry, turning the comedic Porter into a devilish, oily omnipresence in the hands of Michael Hodgson, and rendering the witches as cute onesie-clad kids reciting their spells in childish monotone and thus robbing them of any menace. And here lies the crux of the problem for me. Ostensibly a claustrophobic, driven thriller shot through with tension and inevitability, Findlay’s Macbeth becomes strangely pedestrian and plodding, in spite of all the devices she throws at it in an attempt to make it urgent. There’s plenty of splicing between scenes, chopping up speeches and even a ticking on-stage clock that counts down two hours to Macbeth’s moment of truth. But somehow they all fail to reinforce the text’s inherent sense of time rushing headlong out of Maccy B’s control. Cusack fares better than Eccleston in the roles at the heart of the play. She’s given some fabulous frocks and sensational shoes to wear, and she manages to imbue Lady M with a sense of fragility alongside the outward bravura. Eccleston, meanwhile, never feels quite secure in the lines or the role, and while this might add a certain feeling of tension, it’s tension of the wrong kind: instead of being dragged gleefully towards Macbeth’s psychological collapse, the only true edge-of-the-seat moments are when you wonder who it is who’s actually missed their cue or fluffed a line. It’s one version of Macbeth, even if it’s not quite the one that Will originally created. And while that’s fine for the GCSE syllabus students who can analyse the production at their leisure, it does make for something of a disappointment for those of us who love the play what he wrote. Bloodbath: Joan Iyiola in the title role of The Duchess of Malfi. Photo by Helen Maybanks © RSC. Webster’s violent tale of two brothers’ revenge on their sister is given an unsubtle bloodbath interpretation by director Maria Aberg. A stunning adaptation by Mike Poulton of the Cicero trilogy by Robert Harris, brought vividly to the stage by RSC artistic director Gregory Doran, and featuring a central double act of epic proportions from Richard McCabe and Joseph Kloska. David Edgar’s new adaptation of the Dickens classic stars Phil Davis as Scrooge in a production full of political resonance. Adrian Edmondson in full flow as Malvolio in Twelfth Night. Photo by Manuel Harlan. © RSC. ​The recent Judi Dench film Victoria and Abdul told the true story of the queen’s fascination and friendship in her later years with an Indian servant who became her ‘munshi’, or adviser. Christopher Luscombe’s new production of Twelfth Night for the RSC uses the same basic idea to build a Raj-infused, late-Victorian version of Shakespeare’s frothy comedy. It’s a conceit that works well enough, although there isn’t quite the same sense of infectious vigour as in his double bill of Love’s Labour’s Lost and Much Ado About Nothing a few years back. What it shares with those memorable productions is a stunning look and a pervasive charm. Simon Higlett’s gorgeous design gives us greenhouses, great halls and artists’ boudoirs with all the handsome panache of the era. Lighting designer Tim Mitchell shows them all off to beautiful advantage. Aurally, it’s a feast as well, with Nigel Hess’s pastiche score of Gilbert and Sullivan and music hall ditties giving a fresh take on one of the Bard’s more musical scripts. Among the performances, Kara Tointon as the grieving countess Olivia fulfils the Victoria role stylishly, with a crystalline elegance and delivery. The munshi in this scenario is her fool, Feste, played simply and without unnecessary fireworks by Beruce Khan. 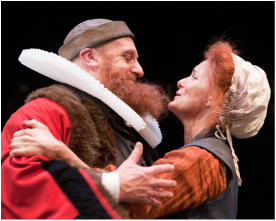 ​John Hodgkinson and Michael Cochrane make a fine, if rather elderly, double act as Sir Toby Belch and Sir Andrew Aguecheek, while Vivien Parry and Sarah Twomey relish their moments as below-stairs servants who turn the tables on their churlish superior, the steward Malvolio. In this crucial role, alternative comedian and erstwhile Young One Adrian Edmondson reveals himself as a rather capable actor when he doesn’t have comedy violence to fall back on. Instead of the angry, dim-witted personae of former years, he has a nice line in understated pompous bombast and an affecting pathos when he’s gulled into his downfall. He’s also given a comic song which raises plenty of laughs but sits rather uncomfortably with the flow of the show. Indeed, the overall tone of the production often feels strangely at odds with the tenor of Shakespeare’s bittersweet, almost melancholic piece and there is, for me, an over-reliance on visual gags and an over-insistence on the Victorian setting in everything from steam trains to pre-Raphaelite painting. But it’s undoubtedly a crowd-pleaser and, with tickets shifting for the festive season, will do well for the company. It’s a sound, solid, entertaining rendition of a perennial favourite. Blanche McIntyre directs David Troughton in the title role of Shakespeare’s gory early play, finding powerful contemporary resonances in her modern-day production. The whole premise of this production of Oscar Wilde’s strangest play is apparently predicated on celebrating the fiftieth anniversary of the decriminalisation of homosexuality. So director Owen Horsley makes a point of linking the two explicitly in the programme, examining Wilde’s own sexuality and reinforcing the notion with the cross-gender casting of Matthew Tennyson in the title role. Tennyson struts the stage in a plain white nightie and shocking pink stilettos, his voice ranging from virtuosic falsetto to strangled estuary vowels. He’s sometimes majestic, occasionally awkward. Never was it clear to me why he is a boy playing a girl. There seems to be absolutely no exploration of alternate text readings, no playing with gender fluidity, no subtle – or blatant – reimagining of Wilde’s meaning and intent. To say this is a wasted opportunity is something of an understatement. Wilde’s strikingly poetic language, his use of simile and metaphor, his rhythmic determination of narrative through layered and textured dialogue all cry out for a radical, even impressionistic treatment. And sometimes we get it. Matthew Pidgeon’s wild-eyed Herod, juiced up on Roman wine and lasciviousness, is a thoroughly dramatic creation, a weak man vaulted into an unearned position of power who’s just ripe for exploitation at the hands of his devious young stepdaughter. Gavin Fowler’s representation of Iokanaan – John the Baptist, as he is known in the biblical version of the tale – has moments of high-flown lyricism to match the lines. Designer Bretta Gerecke and her lightning partner Kristina Hjelm generate an atmosphere of lush dissolution, the strong but under-used ensemble are all on board with the concept of decaying hedonism, and there are glimpses of haunting beauty. But there are also deep inconsistencies of style and approach which badly undermine the overall effect, not least in the ill-matched music of American songwriter Perfume Genius – real name Mike Hadreas. The lyrics of the two sub-1980s stadium rock anthems that are featured not only are impossible to discern but, even with the aid of the words in the programme, add absolutely nothing to the storytelling. Worse than that, they actually get in the way in a really big, loud and unhelpful manner. The delivery of some of the lines is patchy, too. It’s as if there’s been no clear direction about whether to go with the Wildean flights of exoticism or simply play it natural. Unfortunately, natural just doesn’t work in this context. It’s not a disaster by any means, and it’s an important historical landmark to see Wilde performed on an RSC stage for the first time. Seven out of ten for effort, five for execution. ​The plays of Plautus get a modern updating from Phil Porter, with more than a hint of Up Pompeii about the broad comedy. Based on the true(ish) story of Yorkshire’s biggest landowner and his vacillations between Royalists and Parliamentarians at the beginning of the English Civil War, The Hypocrite is a new comedy commissioned jointly from One Man, Two Guv’nors author Richard Bean by the RSC and Hull Truck Theatre. The fact that it has already played in Hull, the current UK City of Culture, is not insignificant as it has not only helped that city’s profile in this auspicious year, but it has also guaranteed a clutch of promising reviews and a warm reception from its initial outing oop north. It may sound harsh to say it, but I suspect the play means much more to a Hull audience than it does in middle-English Stratford-upon-Avon. The reality is that much of its humour struggles to survive the 150-mile journey south. The multitude of local references might have brought the house down in the East Riding but too many of the native playwright Bean’s topical gags are lost in translation. That’s not to say there isn’t much to enjoy about this knockabout, Pythonesque farce. Mark Addy in the title role is particularly entertaining, lurching between Roy Barraclough and Eric Morecambe in his cynical, comical characterisation of Sir John Hotham, a wealthy nobleman torn between loyalty to King Charles I and his new paymasters in Parliament. Caroline Quentin delivers a wonderful turn as his fifth wife Lady Sarah, juggling wide-eyed avarice at the prospect of bags of cash against girlish lust as she pursues free love with her husband’s cousin. And there are some real gems among the supporting ensemble, including Asif Khan’s brilliantly overblown eldest son Captain Jack, Laura Esworthy as the worldly-wise servant girl Connie and the fiendishly acrobatic Danielle Bird as the wordless aged retainer, the aptly-named Drudge. Bean’s comedy is broad, to say the least - there’s one gag involving the severing of a particularly tender piece of the male anatomy that has the audience grimacing - and owes much to the aforementioned Python. There are comedy foreign accents, unfathomably obtuse idiots and even horses portrayed by coconut shells, all of which bear the distinct whiff of someone brought up on The Holy Grail and latterly Spamalot. Grant Olding supplies some anti-Establishment songs as scene-changing interludes, invoking a kind of 17th century Billy Bragg in the hands of talented guitarist-vocalist Josh Sneesby, while director Phillip Breen keeps the pace relentless and breathless. It’s manically frenetic, immensely convoluted and could stand some robust editing. But it’s all silly and big-hearted enough to carry off the night with aplomb and some witty lines, even if it’s unlikely to go down as one the RSC’s greatest hits. It takes a brave man to produce one of Shakespeare’s most rousing plays almost literally in the shadow of the Royal Shakespeare Company building on the banks of the River Avon. Fortunately, Henry V is a brave man. And behind the chain mail is another brave man, John-Robert Partridge, one of the founding fathers of the professional company Tread the Boards. In their regular home at The Attic, just across Bancroft Gardens from the RST, they are staging a patriotic production that runs until the Bard’s birthday on April 23. There are many impressive things about the show. With an adult company of twelve, plus a child performer, it’s a fringe production on a scale that truly merits the adjective ambitious. It’s played out fast and furious in the awkwardly long and thin performance space, complete with terrifying battle scenes and plenty of breathtaking action. And, importantly, the quality of the acting reflects the commitment and backgrounds of the talented cast. There are no weak links among the ensemble, evenly split between male and female with gender-blind casting that demonstrates how admirably it can work. So Dawn Bush gives us a motherly welcome as the down-to-earth Chorus, Ashleigh Dickinson makes an earnest and appealing French herald, and Dru Stephenson combines a touching Mistress Quickly and hilarious French lady-in-waiting with a well-drawn soldierly turn in the pre-battle English camp. The whole cast double up effectively, with Edward Manning and James Tanton particularly versatile in their different roles, while David McCarthy threatens to steal the show with his wonderfully entertaining Welshman Fluellen. Steering clear of the temptation to play it simply for laughs, he finds honour and truth in what is often played as a knockabout comedy routine. Captaining the ship, both as director and leading man, is Partridge himself, offering a noble and stoic Henry and delivering some of Shakespeare’s grandest speeches with clarity and authority. Indeed, clarity is one of the themes of the production, with the storytelling always encouragingly at the fore, even if some of the poetry is lost along the way. Staged on a shoestring, the performance still manages to look imposing and well-dressed, and makes a virtue out of the Chorus’s repeated invitations to use our imaginations to fill in the blanks. It’s easy to picture Shakespeare himself nodding approvingly at the bare-boards, defiantly low-budget approach, and the ambition of the company – not least in the length of the run – deserves to find a supportive audience. An eccentric Josette Simon and powerful Antony Byrne lead a patchy but picturesque version of Shakespeare’s tragedy in the second production of the RSC’s Rome season. 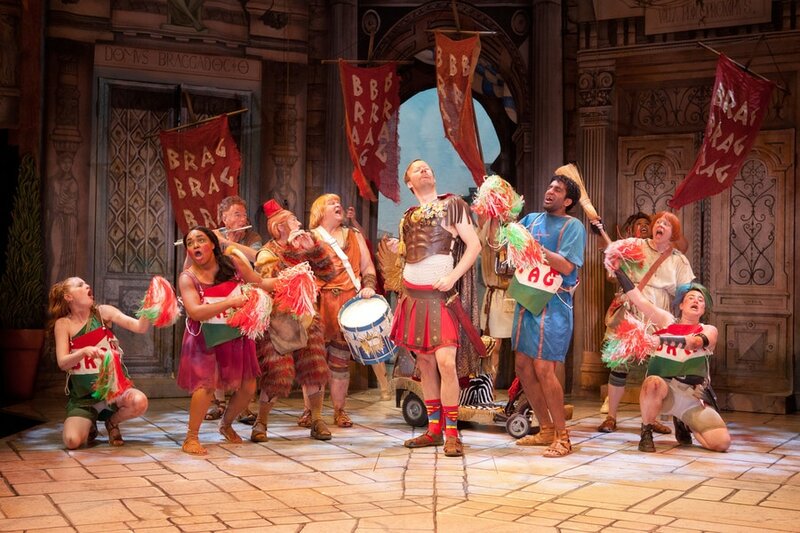 Angus Jackson’s opening salvo in the RSC’s Rome season gets things off to a sparky start. 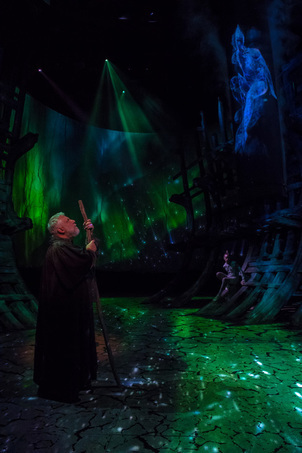 Simon Russell Beale returns to Stratford after more than 20 years, playing a particularly poignant Prospero in a landmark production marked out by its unprecedented use of technological innovation. 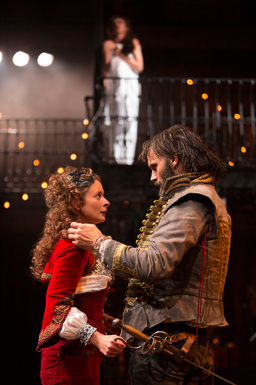 Faye Castelow and Joseph Millson in The Rover. Photo by Ellie Kurttz. © RSC. 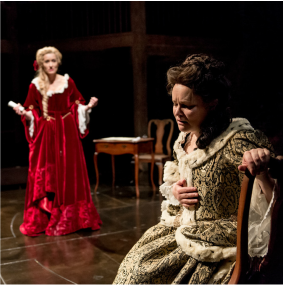 Thirty years on from its appearance at the opening of The Swan, Aphra Behn’s riotous Restoration romp gets the full feminist treatment in a dynamic new production in the same house. Loveday Ingram directs a sumptuous, sultry stroll through the sexual shenanigans of the 1650s. 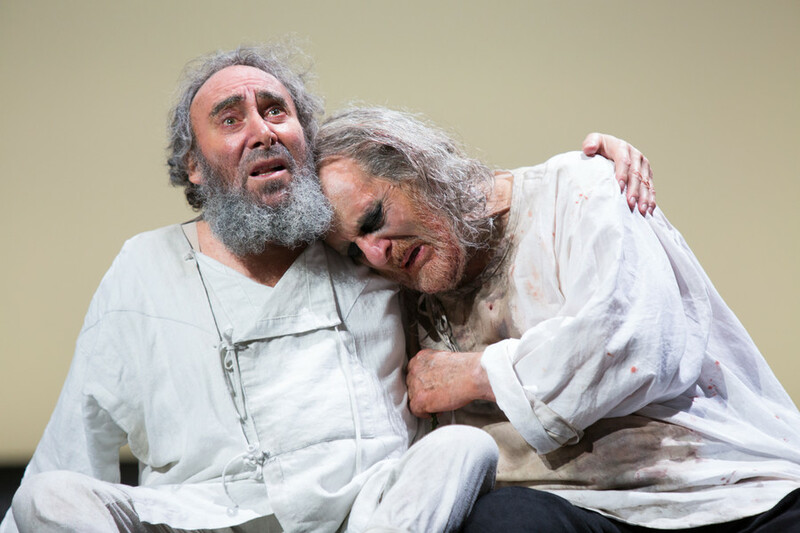 The much-anticipated Antony Sher interpretation of Shakespeare’s monumental role in a production directed by RSC chief Gregory Doran has much to commend it. Shakespeare’s rarely performed final play, co-written with John Fletcher, gets an airing to celebrate the 30th birthday of the RSC’s Swan auditorium. The first two in a summer season quartet of radical plays under the banner Making Mischief get an airing in the RSC’s newly refurbished studio space. Polly Findlay’s romping production of Ben Jonson’s masterpiece makes a worthy addition to the RSC’s summer repertoire. Melly Still’s production grabs the attention and rarely lets go. Forget all the nonsense about the rights or wrongs of a black Hamlet: sit back and enjoy the show. Paapa Essiedu has as much right to the Danish princedom as anyone who’s trodden the Stratford boards in black clothes and mood. In fact – and it’s one of the markers of Simon Godwin’s vivacious new production for the RSC – there’s precious little black to be seen among Paul Wills’s colourful designs and costumes. Transposing the Danish court to a third-world African dictatorship may have its conceptual flaws, but it’s consistently and imaginatively seen through, to considerable dramatic effect. Thus the royal family appear in a range of vibrant outfits to match their heritage, while the Gravedigger is a full-on tribal warrior, complete with body paint and deep red soil in the hole he’s emptying. The travelling players exploit this cultural seam to the max, dancing and festooning the transformed RST with garish hand-daubed banners and tarpaulins. It’s all hugely authentic and simultaneously oddly alienating, adding a thought-provoking new perspective to this best-known of Shakespeare’s tragedies. Among the performances, Essiedu is supreme. His Hamlet is pre-meditated, vengeful but still compassionate, toying with his Ophelia before becoming wracked with guilt after her death. He finds fresh meaning and purpose in his so-famous monologues and combines a stirring adulthood with a childish vulnerability that is strikingly appealing. Clarence Smith is utterly believable, scheming and smarming convincingly as Hamlet’s murderous uncle Claudius, and Cyril Nri delivers an entertainingly wordy Polonius, with an end as dramatic as I’ve seen thanks to a stunning arras and a riveting coup de theatre. 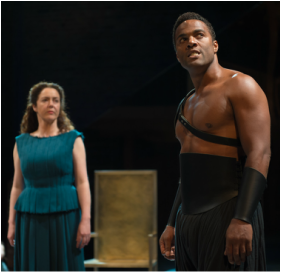 Elsewhere, Natalie Simpson’s painfully poignant Ophelia tugs at the heartstrings while Marcus Griffiths makes the most his indignant, powerful Laertes. Paul Anderson’s terrific lighting reinforces the textures and tones of a hot, arid landscape, while composer Sola Akingbola brings the wildness and menace of the narrative’s undercurrent to exhilarating life with a drum-led, pulsating African score. For Godwin’s second effort in the RST – his first was a pleasing Two Gentlemen of Verona a couple of years back – this Hamlet is a worthy addition to a season commemorating the 400th anniversary of its author’s death. ONE of the main attractions of this new adaptation lies in the return of David Threlfall to the RSC, where he made such an impression well over thirty years ago in the iconic Nicholas Nickleby. 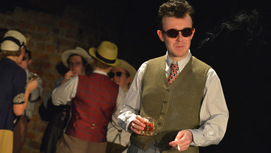 But just as intriguing is the starry line-up of comedian Rufus Hound as Sancho Panza, poet James Fenton doing the adapting and Angus Jackson – fresh from his triumph with Oppenheimer – directing. It’s not just on paper that the combination works enjoyably well. In Jackson’s safe hands, we know we’re in for a rollercoaster ride of physical gags, double-takes and belly-laughs, and the cast revel in every opportunity. Fenton’s script might not have the rapier-sharp satirical edge of the original Cervantes novel, which essentially created a new medium of European fiction, but there’s no shortage of entertaining jokes and amusing set-pieces. Threlfall and Hound make a fine, if unlikely, double act, the elder statesman generously allowing his younger, less experienced compadre take the lion’s share of the laughs. 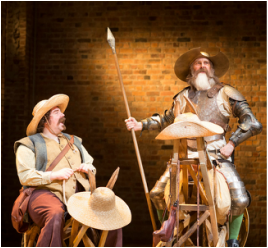 Tottering around like some minor public school Billy Connolly lookalike, Threlfall’s Don Quixote is pathetic and poignant in equal measure, while Hound’s sidekick in a fatsuit runs proceedings amiably and capably enough to allow us to relax into the silliness of the whole enterprise. The spirit of Monty Python is invoked repeatedly, from silly voices to comedy monks, and the episodic nature of Quixote’s adventures only adds to the notion of a collection of sketches strung together. Some punchlines are better than others, and there’s a real sense of things running out of steam badly in the second half, but everyone’s clearly having a ball and it’s infectious. The grand designs of Robert Innes Hopkins make smart use of the Swan’s limitations, while Grant Olding’s songs are charming and atmospheric, even if they don’t add much to the narrative besides extending it to a numbing three-hour marathon. With its palpable daftness and relentless eagerness to please, this Don Quixote hits more windmills than it misses, and makes a worthy tribute to the Spanish writer, the 400th anniversary of whose death we celebrate alongside Shakespeare’s in 2016. The RSC’s new production of Marlowe’s dark drama is something of an endurance test, and not just because it runs for nearly two hours uninterrupted. Besides its length without an interval – inexcusable when there are so many opportunities to split the action and give everyone a break – it’s also a feast of gimmicks and directorial tricks that do little except detract from the magisterial masterpiece. The tricksiness begins before a word is even spoken, with lead actors Sandy Grierson and Oliver Ryan, dressed identically, performing a drawn-out dumb show of mirrored actions culminating in both striking a match. The one whose match burns out first gets to play Faustus. The other is his nemesis Mephistophilis. In the performance I saw, Grierson claimed the title role, his thick Scottish accent adding an additional layer of difficulty to the comprehension of director Maria Aberg’s interpretation. He’s intense, committed and thoughtful but he’s also hamstrung by the production’s heavy-handed conceits and brash sensibilities. Ryan, meanwhile, prowls the stage menacingly in blackened bare feet and a white suit, delivering the whims and wishes of Faustus in return for the brilliant doctor’s soul after 24 years of hedonism. Unfortunately, with Naomi Dawson’s stark, cold design accompanied by Orlando Gough’s sterile score, those 24 years are portrayed as bleak, miserable and superficial, a million miles from the richness of Marlowe’s language and imagery. The soaring text is all but lost under a welter of tacky costumes, pointless musical interludes and an unintentionally comedic chorus of Charlie Chaplin lookalikes punctuating the narrative. It’s hard to blame anyone other than Aberg for all this. With such iconic raw material and a talented cast of actors and musicians at her disposal, she’s managed to reduce one of the great epic tragedies of English literature to tawdry melodrama. Along the way she throws in everything from mime to cross-dressing but it’s all in vain. Where there should be the sinister allure of the occult and the intoxicating appeal of forbidden magicke, there’s some inexplicable jiggling about and a bit of petty revenge. Let’s just say that Faustus hardly makes the most of his two and a half decades of omnipotence. And ultimately, that’s what’s most depressing about the whole enterprise: despite the considerable resources of the RSC and the grand scale of Marlowe’s majestic play, this Doctor Faustus ends up being frustrating, tiresome and very, very long. IT’S hard to fault the intention behind the choice of plays in The Swan. The juxtaposition of some of Shakespeare’s contemporaries alongside the works of the Bard himself makes for fascinating historical context and an important re-evaluation of the importance and sheer extraordinariness of England’s greatest playwright. But the simple fact of their existence is hardly enough to justify their production on the second stage of our foremost Shakespearean company, at considerable expense, with large casts and magnificent resources. Thomas Dekker’s 1599 comedy provides an illustrative case in point. It might have been funny 400 years ago. Actually, I’m not totally convinced of that, but even if it were true, the jokes have failed to survive the intervening years. Some fruity insults and a bit of slapstick do not a comedy make, and director Phillip Breen struggles at times to derive either entertainment or, frankly, much interest from his raw material. Production values are high, with an elegant set design by Max Jones and a six-piece band providing a subtle underscore, while the large company does its best with the uninspired content. David Troughton, leading the cast as the eponymous shoemaker who rises implausibly to become Lord Mayor of London, makes a manful attempt to plumb humour from the long, wordy script, and there’s good comic support from Vivien Parry as his wife. Jack Holden offers the greatest fun of the night as a precocious, haughty but secretly mischievous King – a kind of prototype Prince Harry. But there’s not much else to engage the attention or even provide useful context for what Mr Shakespeare was up to at the same time (Henry V, since you’re asking), and the resulting three hours ends up feeling just a bit worthy but dull. THE story of the 1914 soccer-playing truce across the war-torn trenches of Flanders is so well-known these days as to be almost a cliché. It’s a compliment, then, to Phil Porter’s rewarding and nuanced script that the RSC’s festive offering never strays into melodrama or pathos. In fact, under Erica Whyman’s direction, it delivers emotional punch and historical drama in equal measure. Much of its success is down to the imaginative staging, which converts simple wooden chairs and stepladders into dugouts, church halls and even trains, brilliantly lit by Charles Balfour to supplement the power of the audience’s imagination. 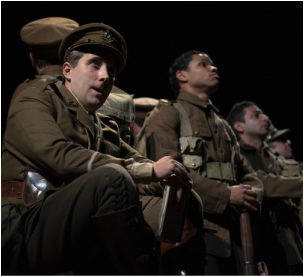 That’s to take nothing away from the excellent cast, who strike exactly the right notes of camaraderie and tension as the story unfolds of the unwilling Warwickshire Regiment heading off to this unwanted war. Joseph Kloska is a beautifully bumbling but dedicated Lieutenant Bruce Bairnsfather, a real-life artist whose cartoons of life in the trenches would go on to become a staple of wartime entertainment. Loved by his men and respected by his colleagues, Bairnsfather emerges in Kloska’s portrait as a quiet hero. By contrast, Gerard Horan is fabulously loud and bombastic as the main object of Bairnsfather’s artistic eye – the comic private immortalised in the cartoons as Old Bill. Horan conveys the wizened old trouper with a judicious mix of affability and world-weariness and ultimately carries the weight of the show on his broad shoulders. Jamie Newall and Nick Haverson lead the opposing forces with style and reserved teutonic flair as members of the Saxon regiment that inspires the Christmas ceasefire with its rendition of Silent Night, and the sense of wary comradeship despite the enmity is almost palpable. There’s a rather superfluous and heavy-handed subplot about squabbling frontline nurses who reach their own form of truce for the greater good, but for the most part, this is a lively, poignant and evocative tribute to the fallen Warwickshires and that extraordinary moment in history. FIRST things first: it’s great to see Eileen Atkins on stage at the RSC, even if it’s as a downtrodden old hag in a ropey old wig. Whenever she’s on – which is sadly not enough in this workmanlike revival of an overblown Jacobean drama – she commands the Swan with her presence. The story is muddled and ridiculous, even by the supernatural standards of the day, and the multiplicity of authors with a nib in the inkpot doesn’t help. Suffice it to say that Atkins’s eponymous witch is accused of all sorts of nefarious goings-on in the village, while the locals are themselves quite capable of some mayhem of their own. Arthur Miller it ain’t, and the anomalous west country accents in the north London setting add another layer of mystification to the proceedings. On the plus side, many of the performances are enjoyable, with Jay Simpson standing out as a bizarrely adorned devil in disguise as a black dog. His movements and leering are appropriately weird, although the overall effect is of a strangely affable demonic force, rather than one of terror. Elsewhere, Faye Castelow is a pleasing peasant girl who meets an untimely end, while stalwarts Geoffrey Freshwater, Ian Redford and Liz Crowther turn in dependable performances as the older generation. Director Gregory Doran stages the whole grim performance on an equally grim set designed by Niki Turner, with usefully underscored music from the ever reliable Paul Englishby, and the result is an interesting curiosity that serves some contextual purpose for Jacobean drama without ever quite sparking into dramatic life itself. LEAVING aside the rather gimmicky idea of re-labelling Much Ado About Nothing as Love’s Labour’s Won (there is a tenuous theory to support it but even artistic director Gregory Doran admits it’s a longshot), the decision to pair these two plays is a stroke of genius. You can’t help wondering why people aren’t doing it all the time. Set either side of the First World War, this unusual but effective framing device allows director Christopher Luscombe to explore Edwardian frippery and Roaring Twenties flappery alongside the darker undertones of both plays, for which the shadow of war proves a useful backdrop. His laudable ambitions and deft direction are reinforced to spectacular effect with some magnificent stagings. Simon Higlett’s extraordinary set, shared by both productions, is sumptuous, hugely imaginative and endlessly versatile in a design as wonderful as any I’ve seen at Stratford in recent years. Combined with Oliver Fenwick’s subtle, supportive lighting, it’s an absolute triumph. The other major technical contributor to the overall success of the production is a simply delightful score from composer Nigel Hess. Capturing the spirit of everything from cod-G&S to some ravishing Ivor Novello-inspired lyrical songs, Hess’s music provides the perfect complement to the action, never interrupting but always enlightening and enhancing, whether it’s in a fully-staged production number or in his judicious, apposite underscoring. With all these elements coming together so seamlessly, it’s a real pleasure to be able to record that the performances soar on this expressive foundation, enjoying the liberation and the playground provided by the creative team. The same cast performs both plays and clearly revels in the opportunities they offer. There’s some beautifully judged comedy from John Hodgkinson as a Spanish guest of the court in LLL, while Nick Haverson makes the most of the twin nincompoops Costard and Dogberry without overblowing the mugging. Sam Alexander makes both a fine, upstanding King of Navarre and a nuanced, villainous Don John, while Michelle Terry offsets her restrained courtier Rosaline with a feisty, full-bodied Beatrice in the later play. But there’s no doubting who’s the king of this double bill, and Edward Bennett is unquestionably up to the sizeable task. 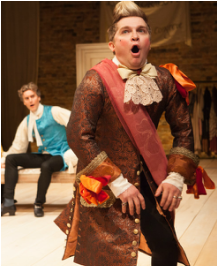 As Berowne in Love’s Labour’s Lost, he plots playfully and hilariously, while his Benedick is commanding, believable and a joy to be in the company of. Whether ramping up the comedy or pausing to heighten the poignancy, his timing is immaculate and he’s at the top of his game. Luscombe coaxes a whole pack of superb performances out of his large, talented cast and, played out against the magical setting delivered by his creatives, conjures up a lost world in vivid reality. It’s merry, moving and a must-see. Director Maria Aberg has, it must be said, a certain style to her work. Keen to update old classics to contemporary dress, feminist sensibilities and in-yer-face ultra-modernism, she’s already exercised these techniques on King John and As You Like It. Now it’s John Webster who gets the treatment. So we’re given provocative video projections, a gender-swapping villain Flaminio and some uncomfortably graphic sexual overtones, coupled with a dispiriting treatment of the female actors in particular. All this gimmickry is utterly unnecessary and ultimately unhelpful. Fortunately, Webster’s revenge tragedy survives as a gripping conspiracy thriller, and it’s largely down to some terrific performances. At the heart of it are the duplicitous adulterers Vittoria and Bracciano, whose scheming results in murder and misery for those around them. Kirsty Bushell and David Sturzaker are both on blistering form, fiery and credible and chillingly watchable as the doomed lovers. Faye Castelow and Keir Charles as their wronged other halves also make a fine impression with their accomplished performances, while Liz Crowther is almost in danger of stealing the show as Vittoria’s heartbroken mother. Laura Elphinstone offers a decent enough Flaminio, and recasting the character as Vittoria’s deceitful sister, rather than dominating brother, is an interesting choice. Less explicable is the decision to make her, alone among her family, a Geordie. But this is typical of the whole production, which is also poorly served by a brash design and some thoroughly irritating underscored music. I would have loved to see this talented clutch of beautifully delivered performances in a staging that truly did them justice. The real tragedy here is that, if you can see past the flashy tricksiness, there’s a stunning show trying desperately to get out. DIRECTOR Simon Godwin makes his debut for the RSC with this zippy, amiable romp through one of Shakespeare’s earliest comedies. 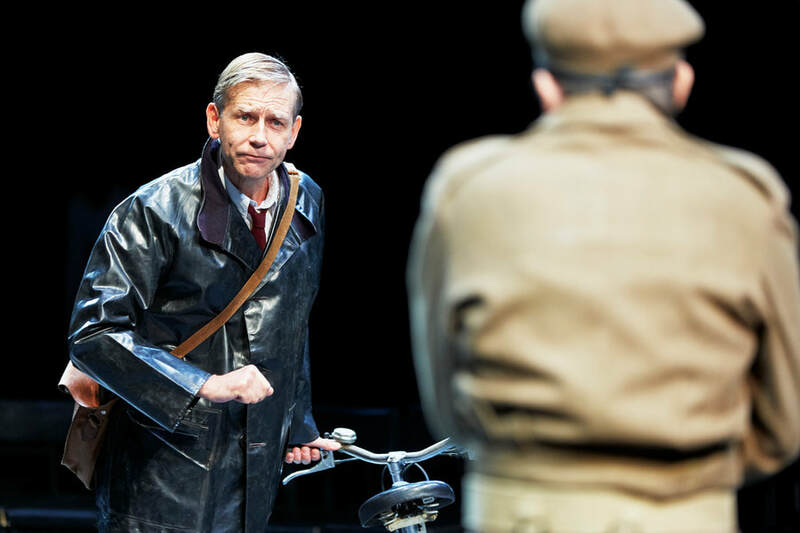 Not fully staged in Stratford for more than 40 years, it provides both a pleasing reacquaintance with the play and a useful calling card for Godwin. The story of thwarted loves, secret elopements and cross dressing – well, this is an early Shakespeare comedy – is clearly told and ably handled by both the director and his talented cast and creative team. Designer Paul Wills gives us a romanticised Italy that’s all checkerboard tablecloths and sharp fashion, providing an elegant backdrop to the well-paced action, while the onstage band of accomplished musicians adds much to the evocative charm. Among the players, Michael Marcus and Sarah MacRae stand out as Valentine and Silvia, one of the pairs of lovers destined to undergo a series of confusions and complications on their path to true love. But there are plenty of other performances to enjoy, not least the partnership between Roger Morlidge as the comedy turn Launce and the show-stealing Mossop as his dog Crab. It’s a very enjoyable presentation of a lesser Bardic piece which should do good business with the summer tourists. And if it fails to lodge firmly in the memory or emerge strikingly as a landmark production, it’s hardly the fault of the actors or their capable commander in chief. IF all you know of Dean Friedman is Lucky Stars and “Well, Well,” Said the Rocking Chair, then you’re missing out. This unassuming but hugely talented singer-songwriter has spent more than 40 years honing a craft that has lost none of its early skill, passion and humour. There are occasional hints of all kinds of other people – Randy Newman, Sting, even Tom Lehrer – but Friedman is unequivocally his own man, a writer and performer with a wealth of entertaining, satirical and occasionally barbed material. His latest UK outing will take in the Edinburgh Festival and a host of dates nationwide as a solo performer, but he’s supported for the first leg of the tour by his stunning band, The South Street Fusion Project. Drummer Kiril Orenstein, virtuoso bassist Chris Talio (wielding an extraordinary seven-string instrument) and Friedman’s own multi-instrumentalist son Sam provide a class accompaniment to their silver-haired frontman. All the old favourites are there, including Lydia, Ariel and the BBC-banned McDonald’s Girl, but they’re judiciously intermingled with some instrumental jazz fusion numbers that dazzlingly showcase the band’s considerable musical talent. Friedman Junior, for instance, proves himself a brilliantly accomplished harmonica player alongside his keyboard skills. The intimate, welcoming venue makes the ideal setting for this warm, witty and rather wonderful performer, who allows his songs to do the talking in the most eloquent fashion. For fans of great musicianship and intelligent songwriting, it’s a chance not to be missed. NOT the most memorable of Shakespeare’s history plays, the two parts of Henry IV can be dense, stodgy and overly political in the wrong hands, making for a long six hours of complex manoeuvring. As RSC artistic director Gregory Doran proves, however, in the right hands they can be fiery, fascinating and fun. This pair of productions have everything going for them. There’s decaying elegance in Stephen Brimson Lewis’s stunning designs and Tim Mitchell’s unobtrusive lighting. 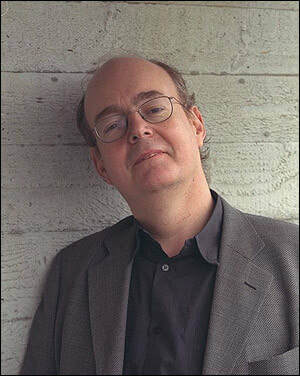 There’s some echoingly haunting music from possibly this country’s finest composer of theatre music, Paul Englishby. And there’s some astonishingly accomplished stage fighting courtesy of veteran fight director Terry King. And all that’s before you even start on the performances. Although named after the king who deposed Richard II (who makes a fleeting but effective appearance to link this play to its David Tennant-starred predecessor), Henry IV is most notable by his relative absence. When he does turn up, however, Jasper Britton makes him highly affecting, wracked with guilt for his usurpation, visibly declining in health and a delicate mixture of brittle and battle-weary. Britton’s verse-speaking is as good as I’ve heard on the new RSC stage and his meaning and intent are crystal-clear as a result – an impressive achievement in this tricky role. 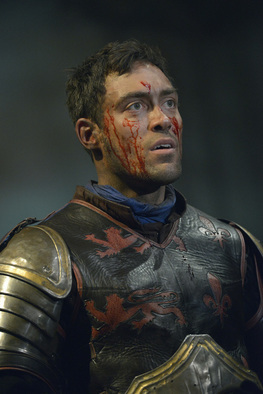 Alex Hassell plays his dissolute son Hal, the Prince of Wales, in wonderfully bombastic, cavalier style, bringing to mind a more contemporary namesake in his reckless disregard for public opinion in the quest for a good time. But when the time comes for repentance and rejection of his former life, he’s powerfully credible and adopts royalty with ease as the new Henry V.
The entire company is strong, promising much for the roll-out of all 36 Shakespeare plays over the next two or three years, and it’s particularly pleasing to see the female parts played as neither wet nor whining – full marks, then, to Jennifer Kirby, Paola Dionisotti and Nia Gwynne. But there’s no question whose night – or should that be knight? – this is. The casting of Sir Antony Sher as Falstaff is nothing short of genius; his performance ditto. With utterly realistic padding and a head swathed in shaggy grey hair and beard, he looks, sounds and behaves as brilliantly roguish as you could hope for. He’s never less than totally believable as the lovable drunkard whose sheer charm and endless fund of invented anecdotes have kept him in sack and good company for years. In the pantheon of Sher’s stellar roles for the RSC, this is, quite simply, as memorable and definitive as any of them. Part 2 may fare a little less well than Part 1, thanks to its intensifying of the politics and power-play, but taken together, these Henrys achieve a reconsideration of the plays within the canon as well worth a second look. THE second in the Swan’s season of Elizabethan and Jacobean plays featuring strong women, under the season title Roaring Girls, is an anonymous, supposedly true story of the scheming wife of a Kent merchant. Together with her young, downmarket lover, she plots the murder of her wealthy husband in a variety of increasingly unlikely ways. While this anti-heroine could hardly be held up as a role model for strong women, there is something distinctly beguiling and appealing about Sharon Small’s portrayal of Alice Arden. She’s got a wicked look in her eye and a swagger in her walk that makes her credibly terrifying as the central figure. Ostensibly a black comedy, the play’s been transported to modern-day London, where its avaricious entrepreneurs, trashy trophy wives and East End gangsters fit in perfectly. Polly Findlay’s assured direction keeps the pace moving through an uninterrupted hour and three-quarters, while the characterisations across the ensemble are clearly well thought through and consistent. Ian Redford may be a little too cuddly and Santa-like as the eponymous merchant, but his mistrust of his wayward wife and his suspicion of those closest to him ring true in his sturdy performance. Keir Charles, meanwhile, invests Alice’s lover Mosby with a smarmy, weaselly charm that is all too believable in this world of crooks and conmen. The story itself, while it may not have the depth or literary prowess of its contemporary Shakespeare, is an entertaining yarn of attempted murder, conspiracy and the abuse of power. Exploiting such dark themes for comic effect is always a little discomforting, but the design, lighting and music (Merle Hensel, Lee Curran and Dan Jones respectively) mesh judiciously to provide an impressive backdrop to the tawdry tale. One word of warning, though: avoid the front row if you’re wearing your best frock. Enough said. IT’S when you see some of the work of his contemporaries that you realise just how good Shakespeare is. 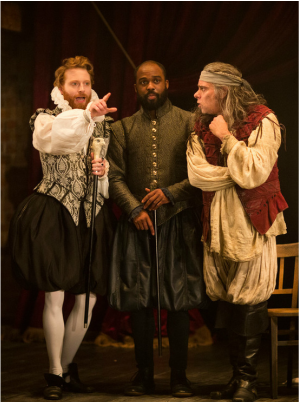 This comedy by Thomas Dekker and Thomas Middleton is an interesting historical curiosity, but barely worthy of the expense, attention and resources that have been thrown at it in this RSC production. Directed by RSC debutante Jo Davies, there’s plenty of knockabout stuff, double entendre and laddish behaviour, but at best it’s broad comedy, at worst coarse, unsatisfying and not all that funny. It doesn’t help that Davies has chosen to set it in Victorian times, with a further anachronism in the bizarre, harsh music soundtrack from Gary Yershon. This fuses vaguely jazzy saxophone, trumpet, drum and bass with some utterly incongruous and mystifying hip-hop, rock and even rap. The result is, frankly, a bit of a mess. Naomi Dawson’s lush designs are completely at odds with the brash tone of the production, while the story itself – such as it is – meanders aimlessly through a series of set pieces with some comedy business thrown in apparently to keep up the tempo. And this highlights the play’s biggest flaw: its paper-thin narrative. Sebastian Wengrave wants to marry Mary Fitzallard but his father thinks she’s beneath him. The young man duly tricks his dad into thinking he wants to marry the dissolute, cross-dressing Moll Cutpurse – the Roaring Girl of the title – so that Mary looks a good choice by comparison. And, er… that’s it. The fundamental problem is that it renders Moll herself as incidental to proceedings, and very much a passive character, not even the main protagonist. There’s some fun to be found in Lisa Dillon’s performance, all East End truculence and boyish swagger, but it’s not enough to carry an evening. Elsewhere, Keir Charles shines as one of Sebastian’s wealthy, charmless coterie, and Christopher Middleton makes the most of a couple of amusing cameos. But overall the large cast’s considerable talents are sadly underused and the finished product – while admittedly going down well with some elements of the audience – is hardly a roaring success. Hilary Mantel’s two award-winning novels about the rise of Henry VIII’s right-hand man Thomas Cromwell are dense, sweeping and epic. In transferring them to the stage, adapter Mike Poulton wisely opts for storytelling clarity above all else. There was a danger, as with his earlier RSC adaptation Morte d’Arthur, that things might descend into Pythonesque self-parody and unintentional comedy. 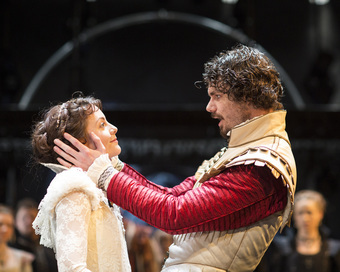 Fortunately for the RSC, the two plays – particularly when viewed together as a single entity – are focused, vibrant and dazzling in their ambition. The narrative is well-served by director Jeremy Herrin, the artistic director of Headlong who here makes his RSC debut with flying colours. What could be a complicated, messy re-interpretation of the traditionally dim view of Cromwell’s scheming instead becomes a fascinating tale of intrigue, self-protection and political manoeuvring to match any modern spin doctor of the likes of Malcolm Tucker in The Thick of It. Playing Cromwell, Ben Miles bears a certain resemblance to the foul-mouthed Tucker, but his machinations are much more subtle and low-key, given the nature of the possible result of getting it wrong. Miles is never less than commanding in a huge role – he’s barely off-stage in more than six hours of theatre – but it’s a performance of nuance and real intelligence, as befits a man who survived three of Henry’s marriage manipulations. Nathaniel Parker is strikingly good as Henry himself, creating a conflicted, three-dimensional character out of the mental caricature we all carry from our schooldays, and these two central figures are well matched by a large and thoroughly dependable supporting cast. Lydia Leonard’s Anne Boleyn, Daniel Fraser as Cromwell’s young son Gregory and Joshua James as his eager clerk are especially confident and impressive, while Paul Jesson’s magisterial Cardinal Wolsey manages to invest this larger-than-life historical giant with pathos and vulnerability. One may not always share Mantel’s evident sympathies with some individuals, but the story as it is unfolded in this sell-out production is constantly gripping, powerfully dramatic and ultimately enlightening. The queue for returns is certainly worth the effort.